The Altiplano (Spanish for high plain), in central South America, where the Andes are at their widest, is the most extensive area of high plateau on earth outside of Tibet. Lake Titicaca is its most known geographical feature. The Altiplano is an area of inland drainage (endorheism) lying in the central Andes, occupying parts of Chile, Argentina, Bolivia, Peru and Ecuador. Its height averages about 3,300 meters (11,000 feet), somewhat less than that of Tibet. Unlike the Tibetan Plateau, however, the Altiplano is dominated by massive active volcanoes of the Central Volcanic Zone to the west. The Atacama Desert, the driest area on the whole planet, lies to the southwest of the Altiplano. In contrast, to the east lies the humid Amazon Rainforest. The salar de Uyuni, or salt flat, will provide you with an unforgettable visual experience as well as one album of photographs friends will envy you for. Pick you up from your Hotel 06:00 Departure by private car to Uyuni . 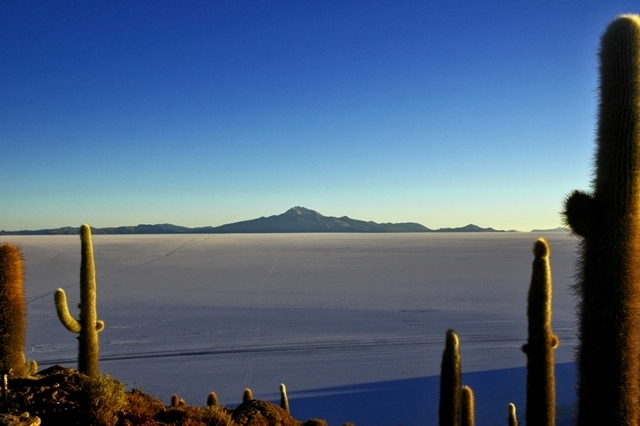 ← Altiplano, Uyuni, salars et volcans La Paz  Potosí - Salar dUyuni - Lagune colorée  Lagune verte  Volcans  Uturunku - Ruines de Tiwanaku - Lac Titicaca - Copacabana  Ile du Soleil  Coroico.